For generations the mop and bucket was the only option for cleaning small spaces, but simply spreading dirt around is neither effective nor sanitary. This is why Clarke developed the MA10 12E Upright Scrubber. Not only does its compact, lightweight design allow you to clean very tight areas, but its superior productivity gets the job done fast, giving you more time for other tasks. 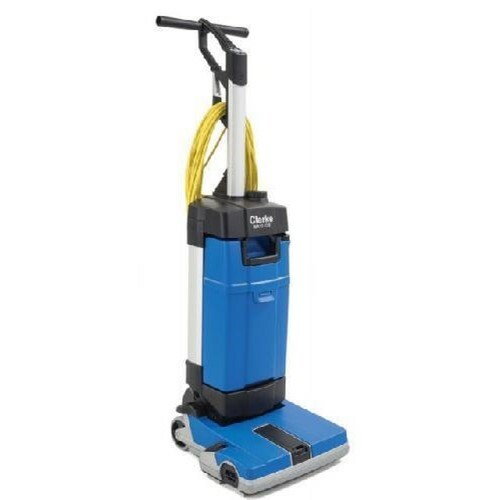 The faster way to cleaner floors - The Clarke MA10 is convenient, easy-to-use features make it perfect for cleaning small, high-traffic spaces quickly and effectively. The single-pass scrub and dry performance provides quick access to cleaned areas, and the comfortable, two-hand grip combined with its light weight made maneuverability and transport easy for an operator. A cleaner clean - With a more effective and efficient cleaning system that removes dirt and water rather than spreading it around like a traditional mop, you not only decrease chances for slip-and-falls, but you create a more hygienic environment as well. The better alternative - The MA10 12E enables you to dramatically increase your cleaning productivity while making daily cleaning tasks much more comfortable and enjoyable, compared to the messy mop and bucket alternative. Simple and Intuitive Controls - Using a scrubber has never been so easy thanks to the simple controls of the MA10 12E brush/vac motor on/off and water on/off. Optional Carpet Cleaning Kit - Freshen up- smaller carpets, including removal of spots, by adding an optional carpet kit. Brush and squeegees can be removed without any tools making daily maintenance operations easy and fast. Low Profile - The MA10 12E has a cleaning clearance of under 4 inches, providing easy access to hard-to-reach areas. Foot Activated Controls - Machine functions stop when in the upright position. MA10 12E Solution Tank - Solution tank dispenses only clean solution, unlike a traditional mop-and-bucket. Lightweight Design - Light weight (26.5 lb) ensures easy transport.